Becker County has over 360,000 acres of forestland, much of it in public control, but including substantial private woodlands as well. Proper forest management helps contribute to the long-term sustainability of forested lands by taking into account the resource needs, public priorities, site capabilities, current regulations, and economics. The forests of Becker County provide a source of income to area loggers and mill operators, as well as providing the raw materials needed for growing communities. These lands also provide a range of public recreation opportunities, wildlife habitat, and tourism resources (source: Becker County Comprehensive Plan). Landscape objectives are long-term, broad-based, multi-ownership objectives designed to provide continued forest sustainability and diversity across a large regional area. The landscape objectives identified by Becker County are based on a report developed by the North Central Regional Landscape Committee entitled Recommended Desired Outcomes, Goals and Strategies; A Report to the Minnesota Forest Resources Council (March 25, 2003). This report outlines the desired future forest condition and recommended goals and strategies to achieve these conditions. 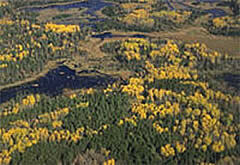 Becker County's landscape objectives are specific to Becker County's landbase and to its forest types, but are designed to assist the regional landscape to achieve its overall desired future conditions. Sustainable harvest calculations are determined by considering long-term management and landscape objectives (i.e. age class imbalance, species conversion, species retention, extended rotation or old growth forests, etc.). The harvest level acres determined by the Sustainable Harvest Calculations include full-harvest, partial harvest, and pre-commercial and commercial thinning. The Annual Harvest Plan includes stand by stand information regarding planned harvest activities for a particular year. Identified forest stands are evaluated for potential harvest and follow-up forest management activities (i.e. artificial regeneration, forest conversion, re-inventory, etc.). Changes to the annual harvest plan may occur without prior notice due to accessibility issues, disease and/or insect damage, wildfire, or errors in the forest inventory.